"Who wants to go to the Yankee Stadium?" Immediately, all eyes were on him. "Go ask your mothers," he said. I ran the half block to my building and up the stairs I went. When I reached my apartment on the 3rd floor, I bounded in, out of breath. I asked, "Mom, can I go see the Yankees play? Danny's father is talking all of us to the game." After answering all kinds of questions about exactly who was going and promising to stay together, my mother consented, packed me a lunch and gave me a dollar. Off I went down the stairs and down the block where all the guys were waiting for me. We piled into the car and off we zoomed. On the way there we were all exited and thinking about all of the N.Y. Yankees, and especially Joe DiMaggio, the "Yankee Clipper". We finally arrived and sat in the bleachers. At that time the price of a bleacher seat was sixty cents. All our eyes were straining to see the Yankees , but all we could see from where we were sitting was a bunch of men moving around in the dugout. Finally, we heard a man announce the names of the Yankees over a loudspeaker, as they ran out to their positions. Joltin' Joe at the Stadium "Joe DiMaggio...playing centerfield" was the name that I last remembered hearing and then, right before my eyes, Joe DiMaggio , the "Yankee Clipper" was running toward centerfield, right in my direction. The crowd was roaring, and I couldn't believe it. So many times as I had listened to the Yankee games on the radio, I would hear Mel Allen announce the names. I always imagined Joe DiMaggio running out to centerfield, but this was the real thing. I couldn't take my eyes off number five, the "Yankee Clipper". 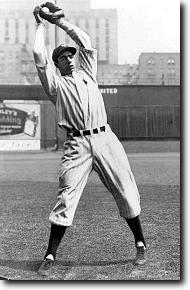 The Yankee pitcher was taking his warmups and Joe DiMaggio was having a catch with Charlie Keller ("King Kong"), the left fielder. This was really too much - the feeling I had on that day so long ago, that I will never forget. All through the game I studied every move number five made. The Yankees won the game, and Joe Dimaggio had a triple and a single. All the way home all we could talk about was "Did you see DiMaggio do this? Did you se DiMaggio do that?" It was quite a day in my life, and even now, whenever I see Joe DiMaggio in a magazine or a newspaper, I still get that warm feeling because I remember that day in June, so very long ago.